We are one of the prominent companies in manufacturing and exporting of U Bolt Kit which is used in construction sites, pharmaceutical industry, automobile industry and chemical industry. 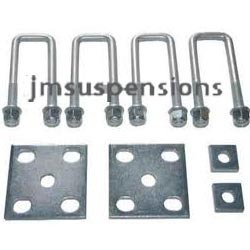 These U Bolt Kit are widely appreciated among our clients due to its easy installation, low maintenance, sturdiness and optimum finish These U Bolt Kit are greatly valued by our clients and are easily available in different regions throughout the country it can be easily available in market with leading prices. These U Bolt Kit are adaptable to fit in all types of necessities. JM Suspensions Components was established in the year 2005. We are the leading Manufacturer, Exporter & supplier. Jm suspension components is a sole proprietorship firm that started its business operations in the year 2005 at jalandhar in punjab, india, is revered as one of the trusted names involved in manufacturing & exporting of all bpw, hutch, fruehauf, ror, york, hendrickson trailer suspension parts & volvo, scania, man, iveco, mercedes, mack truck suspension parts & axle parts. We are headed by mr. Joginder singh, our proprietor, whose hard work, expertise and prolonged industrial experience has helped us carve a distinguish position throughout the globe. His constant endeavors and will to nurture a huge clientele, has enabled us to extend our product range. J M Suspension Components, as your own reliable partner to understand the suspension technology with latest high end technology working platform, world class manufacturing machinery & efficient delivery module. Products by J M Suspension carry all the creditability, precision & reliability to give you the experience of OE or may be any reputed brand. As we believe in quality so each of our product shall carry the option of replacement. Our honourable Founder Mr. Ajit Singh believed in "giving back" so each dealing shall generate the same respect, trust & pride to work longer, improvement in basic & in the end shall generate prosperity to all of us who join the family. As, we do believe on relevance of ISO, Standard & Poor's & ISI ratings, we have the internal commitment & expertise to satisfy all the level in this business i.e. vendors, dealers, stockists & of course our end user, who shall strongly believe in our brand. Our sprit lies in improvement, innovation & commitment to any feedback which shall drive growth. To experience all the comfort, prosperity, innovation & making things happen for the better let's join the credible family of J M Suspension Components. We also pledge our infinite effort to deliver the best in all aspects.